We’ve seen it in the news, streams on facebook walls and discussion over the watercooler. It is quite a debate on censoring Social Media. With ruling politicians in India (Kapil Sibal) making noise on it, international reactions from Ban Ki Moon (current Secretary-General of the United Nations) and Hillary Clinton voicing opinions on it. It is interesting to note that World’s largest democracy is engaging in battles over the future of how information can be monitored and circulated online. This was the hot topic at the 84th Social Media Breakfast in New Delhi. Our aim was to stir up a discussion, and look at the current evolution of Social Media as a platform to communicate. The Meetup turned out as expected, a divided house on the issue of Social Censorship in India, though towards the end we agreed to have a consensus on having a user poll to determine the winner. Social Media unlike the traditional media channels is wildly democratic, everyone has a voice and the source of stories get lost when it receives the viral status. You cannot ban people from expressing or censor if they have something to say. Was Spiderman right in saying this? Social Media is giving powerful tools to the people to communicate, to voice their opinions, share their ideas and biases at the same time. Its a wildly democratic new kind of online society building up, which can topple governments, bring big brands to task, can cause riots and can spread the viral love. On one hand, someone morphs pictures of sacred religious figures in one part of the world, and riots break out on the other side of the globe. On other hand, funny videos bring everyone together in one great viral glue. The world has never seen sharing information at this speed, evident from the fact that governments are figuring ways out to control this beast. China on one side are clear about their censorship policies, companies not complying with them are shown the door (Google). Countries like India are still figuring out what to do with this monster, which looks like the tip of an iceberg. With the discussion divided on the issue of censoring or monitoring social media, we did agree that the framework to prevent abuse on Social Media must evolve organically. If some users can abuse the medium, others can clean it. It was decided to have a user poll by way of this post, both views are expressed below, What do you think? 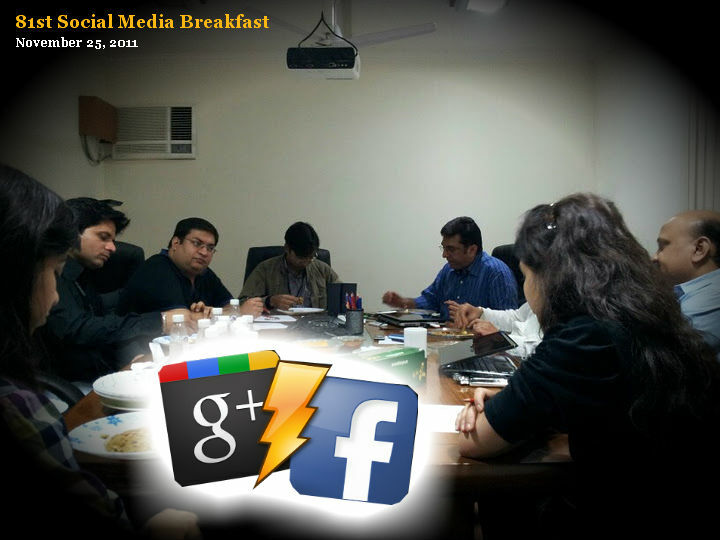 81st Social Media Breakfast: Who wants to Faceboogle? It’s what happens when everyone gets into a Facebook vs Google debate. And that was the scene at the 81st Social Media Breakfast. The topic today was about comparing features of Facebook pages vs Google Plus business pages, but it took an insightful detour into the hot topic of Social Media ROI. It was wonderful to listen to different experiences in running Facebook campaigns and observations about Google plus. Google plus is new, its exciting for businesses, specially with Google’s Search weight thrown behind it. When Google bakes search and social together, ROI on social starts getting linked with Search revenue and that’s the sweet spot isn’t it. It was evident from the show of hands that not everyone is active on Google plus, even though everyone has an account and were first to get it. As Sharad Poddar mentioned, its the resistance to change for any new technology or platform, and as user’s perception changes, so will the usage patterns. For example the common perception of Facebook usage is different from LinkedIn usage, I guess coz on LinkedIn profiles pics, everyone is wearing a tie and we all know how you can’t party with a tie on! One question which started the whole Facebook vs Google+ debate was about the direct benefit any business can get from Facebook Page marketing. Even though having a community, a fan base is an awesome thing for a business, but direct measurable benefit is a tall order. As Mani Singh calls ‘Post Blindness’ when your post gets lost in the chaos. If it didn’t get any likes or comments or ‘Edge’ as facebook calls it, then by the famous ‘EdgeRank’ system, your posts get lost anyway. I always think of ‘EdgeRank’ in this way: Imagine all the posts are like helium balloons , the higher up they go, the harder it to see them, with every like or comment, balloon gets weight attached to it and it keeps it visible, the posts with more weight (edges) get more visibility. Not sure if the analogy was accurate, but I guess you get it. To get that traction on every post takes a lot of work and creativity and Facebook Insights is something which needs to improve, compared to what Google Analytics does for websites, we need powerful analytics for pages. The first direct benefit of Google Plus pages is faster indexing of your pages for Google Search. The Return on Search is well worked out over the last few years, with Google Plus Social gets baked into search. We’re still watching Google+ features evolve, with ‘Add to Circles’ showing up in search results next to your website. The amount of effort you invest in building up a Facebook Fan page, if spent on Google plus will show you results in Search as well, thats what makes the ROI a sweet possibility with Google plus. And offcourse with industry leading analytics tool, Google plus had the advantage of great analytics coming soon. Other points in the discussion worth mentioning are about keeping your business closely guarded from your competition, or working with business secrets and keeping competition away. As Mani rightly pointed, the emerging business ecosystem is about transparency and new challenges, its survival of smartest all over again. All in all an awesome way to start a Friday morning, a good breakfast, insightful discussions and a group full of energy. But this Faceboogle thing deserves more than one discussion, because change as they say happens faster online than offline.